Dwight Howard returning to play in his hometown was a huge story around the NBA and the city of Atlanta, when the signing was announced during the Free Agency. After three seasons, Howard decline his player option with the Houston Rockets and opted out of his contract after dealing with injuries, locker room issues, and obvious decline from his days as the best center in the NBA. Howard posted (13.7) points per game and fewer than (9) field goal attempts per game in the 2015-2016 season, his lowest numbers recorded since his rookie season. Howard began the search for his next NBA destination and possibly his final NBA contract as well. The Atlanta Hawks received the first and final meeting. Howard took phone calls from other organizations, but never met face to face as he did with Atlanta. The Atlanta Hawks signed Dwight Howard to a (3) year, ($70.5) million-dollar contract. Howard’s signing received mixed reviews from the start, however when the regular season began, the city of Atlanta was excited to see the new look Atlanta Hawks. Howard brought in two key attributes that the previous Hawks playoff teams didn’t have, a rebounding presence in the paint and rim protector. The biggest question of Howard’s signing with the Hawks was how would his declining game work with Coach Budenholzer’s system after watching Al Horford eventually become a perimeter defender and end his career in Atlanta taking more three pointers than in his previous years in the NBA. Also, the critics wanted to see if the veteran NBA center whether Dwight could fit with his inability to get up and down the court as well as spacing the floor. The Howard signing by the Hawks was looking pretty good in the first few weeks of the season as the Hawks jumped out to a 9-2 record. The positive energy that was surrounding the team and the city was exhilarating. Watching the Hawks play their brand of basketball while enjoying the additional presence of a player of Howard’s caliber was amazing. The Hawks appeared to be considered as an Eastern Conference contender for the 2016-17 campaign. Unfortunately, all good things must come to an end, the Hawks success quickly faded. The finger pointing began for the Hawks inconsistencies and once again, Howard was the center of blame. However, it was unfair criticism considered the 31 year old veteran played as well as could be expected for a player of his age and size. Howard posted a career high in field goal percentage with (63.3%), averaged (13.5) Points Per Game, (12.7) Rebounds Per Game, and (1.7) Assists Per Game on the season. He posted his best rebounding per game average since the 2011-2012 campaign, while averaging 4 offensive rebounds per game, his second-highest mark in his career. Howard managed to finish 6th in the league in total rebounding as well as the top 10 in offensive rebounding and defensive rebounding. Howard was also a monster in double-double category, finishing tied for 6th in the NBA in double-doubles with (53). Dwight also was a huge upgrade on the defensive end of the floor, finishing in the Top 20 of the NBA in Blocked Shots with (92). With Howard’s success, there was still struggles, in particular, Howard’s inability to create a shot at times received a lot of criticism in the Regular Season in the Playoffs against the Washington Wizards. So much that in several games in that series, he was on the bench instead of making an impact. Also, Howard was forced to guard the pick and roll and leave his comfort zone, the paint. Dwight is well known for being a dominant force in the paint and was a former Defensive Player of the Year as a shot blocker. Although some would say “His best days were 10 years ago” and although that’s his strongest asset to the Hawks would serve as defensive liability against John Wall, Bradley Beal and the Wizards. Dwight Howard had a pretty good season, with what was expected from a reasonable fan. There were a few games in general where he dominated similar to the Orlando Magic days, when the Superstar advanced to the NBA Finals. Howard had several great games, posting (30) points & (10) rebound in a game against the Los Angeles Lakers in November as well as a (23) point and (21) rebound game against the Indiana Pacers. However, his best performance was against his former team, the Houston Rockets team as Atlanta erased a 20- point 4th quarter deficit. Howard shot 11-13 and scored (24) points and added (23) rebounds to help the Hawks storm back and stun his former club. Although the season didn’t end well for Howard, it was apparent that he was upset with the lack of minutes in the Playoffs saying he wanted to be on the court to help the Hawks win. However, the situation plays out Howard is under contract for two more years of guaranteed money and the Hawks haven’t received any type of offer they’d accept for him. So for the forseeable future, both sides need to work together in order to improve the situation for the sake of the team. The biggest question mark moving forward is how Budenholzer will make a more concerted effort to make Howard a bigger part of the offense. Howard said in recent interviews that he’s planning to expand his offensive game, whether it’s working on his midrange or three-point shot. 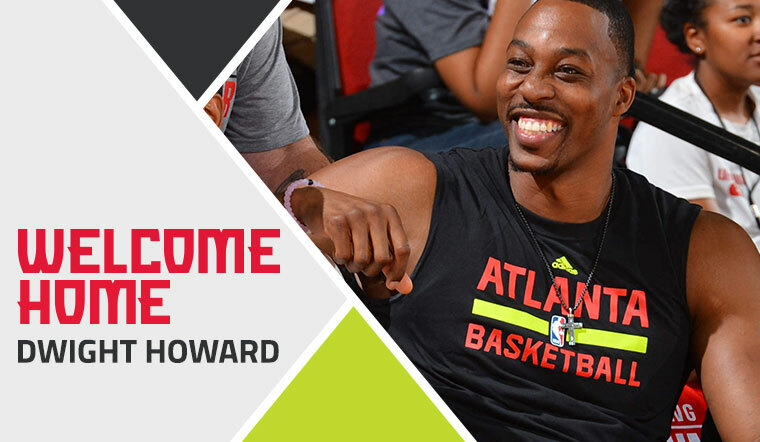 Either way, over the next few weeks, we’ll know the future of Dwight Howard in a Hawks uniform. Personally, I am optimistic that both parties can survive a seemingly drama free season and continue to improve and work towards the ultimate goal, a NBA Championship.